Dies R Us: Framed Honeyblossom! Hello Dies R Us friends! Vickie Y with you today sharing an elegant framed blossom. The intricate frame was die cut from ultra smooth white cardstock using Frantic Stamper Oval and Filagree Frame. I used the Spellbinders Tool in One to remove the chads from the frame. 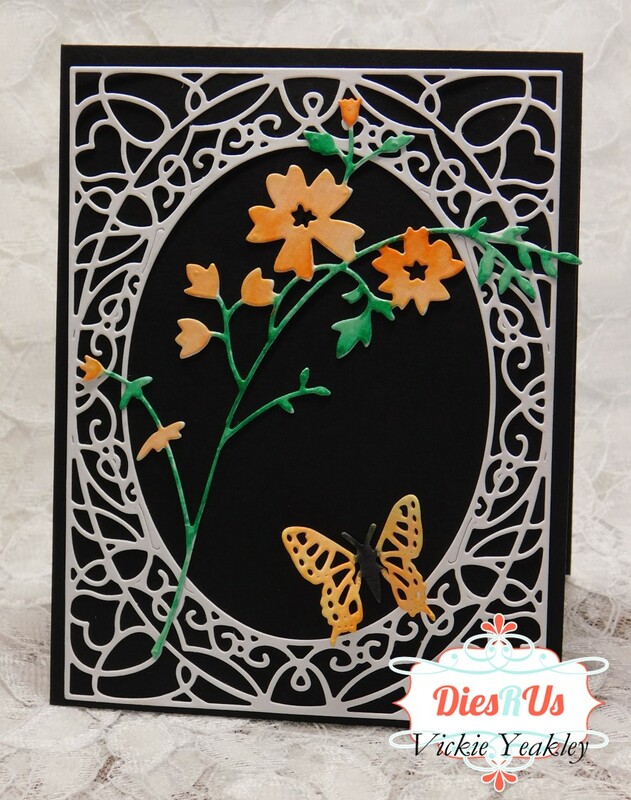 I then die cut from watercolor paper the Memory Box Honeyblossom Sprig and die cut one of the dies from the Cheery Lynn Designs Small Exotic Butterflies #1. I used an aquabrush and Zig Clean Color Real Brush Pens to color the Honeyblossom Sprig and Butterfly. I used black cardstock as the cardbase and adhered the die cut frame to the base. Tip: Use a glue pen to dab glue onto the intricate lines of the die cut to insure it will adhere to the cardstock. Next, I placed the Honeyblossom Sprig and Butterfly onto the card front overlapping the frame with the sprig. This was a very easy and quick card to create and can be used for many occasions. Wow! Love the beautiful, elegant frame. Nice layout. This is so pretty and elegant! The colors just pop against that black background. Beautifully done! How beautiful and what a fabulous design! The colors really POP! Awesome inspiration Vic ... thanks! This is so pretty, Vickie!